Well, looky dis! –>Click on the ticky because I don’t know how to embed it. Sorry. I’m lame. I’m on virtual tour to promote the release of Waking Savannah (October 25th) along with sister in Lyrical Shine, Heather Heyford. Enter to win an ecopy of BOTH our books! After I got my faboo review for Dreaming August, Ind’tale sent me an offer to get in on a trailer they put out once a month. (<– if you want to see it.) I took them up on it, and this is the result. Fun, huh? WOMEN’S FICTION: Johanna Coco has returned to Bitterly, Connecticut to attend her grandmother’s funeral but misses it. Charlie McCallan finds her in the cemetery and brings her home. For Johanna, Charlie is everything in her past that she has tried to forget. For Charlie, Johanna is everything he wants in his future. One would have thought that this was a straight love story, but the underlying sub-plot of finding Johanna’s mother, plus the mental illness that affects Johanna and her sister’s life choices, makes the story multifaceted and interesting. It is a love story revolving around the Coco daughters and their missing mother and the secret that their grandmother kept. To juggle more than one subplot to bring the love story, between a man and a woman, and among the women of the Coco family, forward is a feat in itself which Ms. Defino does very well. She has also allowed one to see the internal conflict of each of the characters in varying degrees (including that of the secondary characters) leading to a rich tapestry of the lives and loves of the people in Bitterly, Connecticut. While the characterization was rich, the setting was limited only to the places where the characters went. Sometimes it came across like sets inside a studio. Nevertheless, the poetry that precedes every chapter more than makes up for this. Ms. Defino is one author to watch out for because of the beautiful stories she writes. WOMEN’S FICTION: Benedetta “Benny” Grady is a widow who continues to pine for her dead husband. She religiously visits the cemetery and plants flowers around his grave, speaking to him and also to Mrs. Fargus and to August, each of whom died centuries ago. Benny has a secret, something that she only tells her dead husband and ghostly friends and would like to hide from one person she has fallen in love with – her husband’s best friend, Dan Greene. Dan has fallen for Benny and plans to woo her but she keeps on avoiding him until she finally gives in. But then Dan unearths her secret and it’s now his turn to move away. Ms. DeFino is a remarkable storyteller. Her writing style is as beautiful as it is original. One wishes that they lived in Bitterly, Connecticut in order to know Benny and Dan, as well as a host of other secondary characters that give meat to the story. These characters have their own stories to tell and are not just included in the story as props. Readers will come to love August and Mrs. Fargus and get a glimpse of what life after death must be like. Their dialogue about the great beyond is as humorous as it is bittersweet. Ms. DeFino is definitely an author to watch! The second book in my Bitterly Suite series with Kensington/Lyrical Shine, Dreaming August, releases today! Woohoo! To celebrate, I’m giving stuff away. Here’s how it works. The first fifteen readers who buy a copy (digital or paperback) of Dreaming August will get a FREE digital copy of Seeking Carolina. 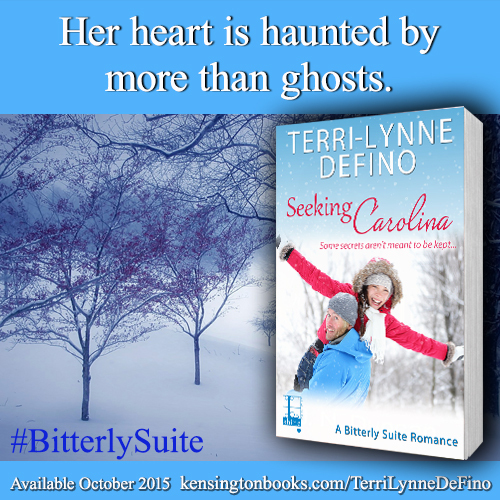 All you have to do is send a copy of your receipt, from whatever venue you purchased from, to terrilynnedefino (at) aol (dot) com and I will send you a code to get your free copy of Seeking Carolina for the ereader of your choice. For the first fifteen readers who buy a copy of Seeking Carolina, digital or paperback, I’m giving a free digital copy of Dreaming August! Yup! So if you haven’t gotten around to buying Seeking Carolina yet, there’s no better time than the present. Same process as above. Supplies are limited, so don’t put it off. Buy it, read it, and if you really love me, you’ll review it. 🙂 Two books for the price of one–how can you go wrong? Please feel free to share on FB, Tweet, tell your neighbor, co-worker, grandma, best friend, your dog if they have access to a computer even if they don’t know how to read. You know how dogs are–they love to buy things on the internet. Why should you get it now aside from that? Because Dreaming August, second book in the Bitterly Suite, comes out on April 12th. Reading Dreaming August doesn’t require Seeking Carolina, but, oh how nice to spend some time in Bitterly with all the different characters poking their heads in to say hi. One sale until March 1st! Get it while the gettin’s good! I’m a fortunate author. I get emails and FB messages, cards in the mail saying how much readers loved Seeking Carolina. It thrills me, every time, and is typically followed by the thought, “if only they’d put this up on Amazon, or Goodreads, that’d be really awesome.” Then I feel bad, because how greedy is that? Isn’t it extraordinary that friends, family, long-lost acquaintances, strangers would take the time to send me a personal note about how much they loved my book? Yes it is. It bothers the crap out of me that I have to worry about such praise going up in a public venue just so the machines powering the industry can rank me, promise me visibility. It feels really wrong, and yet, without it, my future work is in jeopardy, because–as we’ve all found out somewhere along the line or the other–it’s about numbers, first and foremost. The general population doesn’t know (and shouldn’t) much about the publishing world. I’m a “little” author. I’m not in bookstores, on talk shows, in magazines. My work is fairly invisible to the reading world at large. I blog. My publisher promotes my book on sites trafficked by romance readers. But my reach is limited. Nora Roberts doesn’t need reader reviews. I, and other small authors like me, do. In a world where any potential publisher, agent, reader can look you up and make a judgement based on the numbers they find, the slope gets really slippery. On the one hand, I want no part of it. On the other, I have no choice but to drink the Kool-Aid. So I’m going to go out on a limb here, and ask–If you’ve read Seeking Carolina, consider putting up a review on Amazon, Goodreads, Barnes & Noble. It matters. Thanks. Hmmm…cherry Kool-Aid isn’t so bad. Leaves my tongue red though.